In early 2014 a military conflict erupted in the South and South-Eastern parts of Ukraine. As of February 2017, the number of IDPs in Ukraine reached 1 640 335 people. 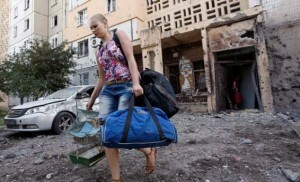 The majority are former residents of Donetsk and Luhansk regions, who registered as IDPs in the nearby areas of Eastern Ukraine. During the first eight months of the Ukrainian crisis, the Ukrainian state struggled to establish a comprehensive legal framework and unified IDP registration system. This problem weakened the ability of state and non-state actors to provide adequate assistance to IDPs. It restricted the ability of IDPs to exercise their political rights and freedoms as Ukrainian citizens. The law ‘On ensuring rights and freedoms of internally displaced persons’ adopted in October 2014 provided a legal definition of an IDP. It confirmed IDPs’ rights and freedoms as Ukrainian citizens and regulated the matters of registration and provision of state aid. Thus far during the military conflict, Ukraine has held three elections. The conditions for IDP voters’ to exercise their electoral rights varied. Following the protests that ousted President Viktor Yanukovych in February 2014, the parliament voted to officially remove him from power and called for early presidential elections a few months later. The elected president, Petro Poroshenko, continued the process of political change. At the end of August, Ukraine called early parliamentary elections for October 2014. A year later, local elections were held. Instability and the implementation of other political reforms set in motion by Euromaidan resulted in big changes to the electoral laws. Most of these laws were adopted in a hasty manner and shortly before the elections. The laws and their implementation were thought to have caused confusion among the voting public. How Effective Were the New IDP Voting Laws? The only legal changes designed to improve IDPs’ electoral access to the vote was a minor relaxation of voter registration procedures. It exempted IDPs from the obligation to provide justification for temporary change of polling station. The changes were adopted without any consultations with IDPs and were not followed by appropriate voter education campaigns. The national IDP law assured full voting rights for the internally displaced, but in the 2014 parliamentary elections and the 2015 local elections, the provision collided with existing electoral laws. In the 2014 parliamentary elections (based on a parallel proportional-majoritarian system), the existing electoral framework effectively excluded IDPs from voting in the majoritarian part of the elections. In the case of 2015 local elections, IDPs’ voting rights were severely restricted by the existing electoral framework, according to which only citizens permanently residing in the constituency were allowed to vote (art.1.2 CEC № 893, The law of Ukraine “On Local Elections” 2015). Astoundingly, IDPs from areas controlled by the government where the elections were held could not cast an absentee ballot to choose local authorities at their constituencies of origin. IDPs could be eligible for vote only if they chose to register as permanent residents at their new locations, but under the laws at the time, they ran a risk of losing their IDP status. The Ukrainian government did not provide an alternative solution to ensure participation of IDP voters (such as voting for representatives ‘in exile’) neither in the case of the majoritarian part of the 2014 parliamentary elections nor in local elections of 2015. The Ukrainian case shows how the relaxation of existing absentee voting laws is not enough to protect the voting rights of internally displaced populations. Enfranchisement of IDPs requires comprehensive changes to the electoral law that are based on consultations with the displaced and meet their specific needs. Lawmakers should always consider the dynamic situation on the ground. The potential of democratic elections to foster national unity and stability in conflict-ridden societies can only be fulfilled if the electoral process is truly inclusive. For IDPs, electoral participation is an important way to affirm their citizenship rights and prevent further marginalization. In case of the three elections thus far, the Ukrainian government did little to protect the political and electoral rights of IDPs. In this way, Ukraine failed to ensure inclusive character of the democratic process and to uphold its obligations toward internally displaced citizens of the country. This article is based on “Internally Displaced Persons and Elections under Military Conflict in Ukraine” by Dorota Woroniecka-Krzyżanowska and Nika Palaguta, published in 2016 in the Journal of Refugee Studies, doi: 10.1093/jrs/few021. Dorota Woroniecka-Krzyżanowska received her PhD at the Polish Academy of Sciences and is on a National Science Centre Postdoctoral Scholarship at the University of Lodz on the topic of Palestinian refugees. Nika Palaguta is a PhD student at the Polish Academy of Sciences, and co-editor of the book, Towards Electoral Control in Central and Eastern Europe. Law of Ukraine №1706-VII “On ensuring of rights and freedoms of internally displaced persons” from 20.10.2014 as available from the webpage of UNHCR: http://unhcr.org.ua/en/2011-08-26-06-58-56/news-archive/1231-internally-displaced-people (accessed on 25.12.2016). In case of presidential elections the relaxation concerned only voters whose electoral address was on the territory of Autonomous Republic of Crimea (amendment № 240 to the CEC № 893). The relaxation was extended to include citizens from Donetsk and Luhansk regions only nineteen days before the 26th October parliamentary elections (CEC resolution № 1529).